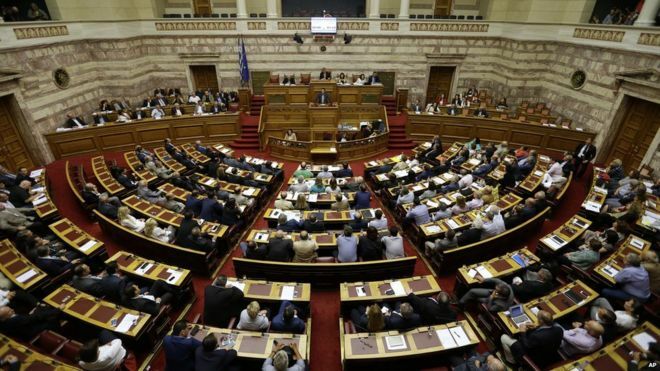 In a late-night debate, Prime Minister Alexis Tsipras admitted many proposals fell short of his party's anti-austerity promises.Greece's parliament has backed a government package of economic reforms aimed at ending the country's debt crisis and securing a new bailout. But he said there was a "national duty to keep our people alive and in the eurozone". The proposals are to be studied by eurozone finance ministers later. EU sources says Greece's creditors - the European Commission, the European Central Bank and the International Monetary Fund - believe the plan is positive. Eurozone officials are also expected to discuss Greek requests for some of the debt to be rescheduled. While a majority of the 300-member parliament backed the plans in the early hours of Saturday, several government MPs voted against or abstained. Mr Tsipras is asking for €53.5bn ($59.47bn) to cover Greece's debts until 2018. In return, he has given in to demands for a pension overhaul, tax rises and privatisations - measures rejected in a referendum last Sunday. Greek banks are days away from running out of money and unless a deal is struck the country faces exiting the euro. The BBC's Mark Lowen in Athens says the Greek reform package is a major climbdown for the prime minister, whose radical left-wing Syriza party was elected on a strong anti-austerity platform.